You can row a boat made of chili. You can enjoy an easy morning stroll among asparagus trees. You will be excited alongside the racetrack, which is actually the surface of a vinyl record. In this miniature world life looks ordinary – yet from a different perspective. 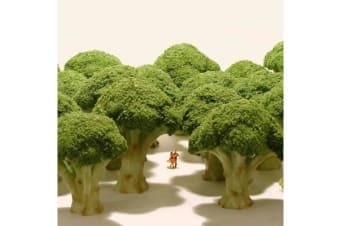 Japanese photographer Tatsuya Tanaka started posting miniature pictures every day in in 2011, calling it “Miniature Calendar.” Since then more than 2,000 images have been posted on his website, and he now has 600,000+ followers on Instagram and gets 115,000+ likes on Facebook. In this book you can find more than 100 works created by utilizing everyday objects, tiny figures, and an immense amount of imagination. You will be amazed by the ideas found in the ordinary things around you that bring back the curiosity you used to have in childhood.